Pacific Vial Manufacturing Inc manufactures Dropper Assemblies to satisfy almost any requirement of your glass vial needs. BULBS, CLOSURES and PIPETTES are available in a variety of sizes, styles and materials. Regardless of the application, Pacific Vial has the part that fits. CLOSURES: Standard closure in Black or White. 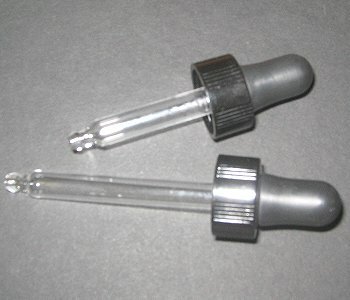 PIPETTES: Type I Glass with Bead-tip, available at 50mm and 70mm length. Contact Pacific Vial by telephone at 866-686-VIAL or by email at info@pacificvial.com for custom color and sizes and information on pricing and volume discounts. Pacific Vial is a name you can trust for the highest quality products in the industry.